Milford, NJ, February 26, 2018 --(PR.com)-- Global Healthcare Management proudly announces its sponsorship of the 2018 Valerie Fund Walk & JAG Physical Therapy 5K Run. 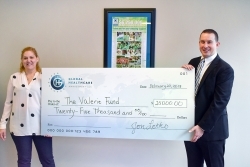 Global Healthcare Management will show their support for the Valerie Fund by signing on as a major sponsor of this event, a commitment that includes a donation of $25,000. Global Healthcare Management’s team is proud to be walking for the second year in a row to raise money for the Valerie Fund and the important cause it champions.